*There is some animal hair on the material that should wash right out. Sure, getting out of work on a Friday is freeing. So is driving through beautiful winter scenery on your way to the mountain the next morning. But it's hard to match the freedom of hitting your favorite run at Mach 5 or bouncing through secret powder fields in knee deep snow. Wherever you shred and however you seek freedom, The North Face's Freedom Pant will help you find your happy place on the mountain. Its lightweight, waterproof, and breathable DryVent membrane will keep you protected when snow is falling and when you're falling in the snow. 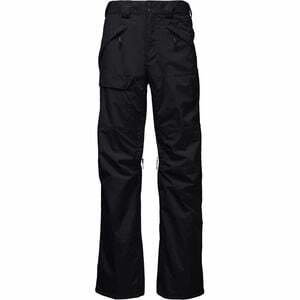 StretchVent gaiters at the leg openings prevent snow from sneaking in the bottom when you're hitting your reliable powder stash, and they also work with the inner thigh vents to trap heat so it rises up and out for a more effective venting system. The Freedom has also been updated with a more articulated fit, giving you easier and more fluid movement for bump runs and tight tree lines. With secure pockets for easy storage of maps and snacks, and a price point that won't break the bank, this pant will keep you feeling free all season long.